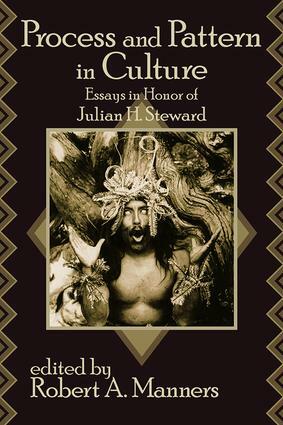 This festschrift commemorates Julian H. Steward. The essays were contributed by former students, colleagues, and other anthropologists whose research or thinking has been influenced by him. There was no preconceived attempt to give the volume any greater sense of unity or to impose upon the contributors any restrictions as to subject matter. On the contrary, each author was urged to write on an anthropological topic of greatest current interest to himself. Many of the essays could be placed just as handily within a division other than the one to which they have arbitrarily been assigned in the book. This kind of interchangeability may reflect, in some measure, the interrelatedness of Steward's contributions to anthropological theory. The broad relevance of all the selections to Steward's work could reflect also the extent to which his interests continue to be reflected in the work of anthropologists influenced by him. It could also reflect a parallelism of theoretical concerns within the profession that stem from the cultural ambience that produced Steward himself. Parallelisms and convergence are aspects of the kind of cultural determinism which has claimed Steward's attention during the many years that he fought a fairly lonely battle to establish the respectability of evolutionism in anthropology. Now that respectability has been achieved--with an almost bandwagon fervor--it is clear that Steward, as much as anyone else in anthropology, was "responsible" for the change. The essays in this collection are at once a vindication of his patience, an evidence of the high status he enjoys among anthropologists, and a testimony to the impact of his unusual creativity on his colleagues.